I always like my roughs better than my cleanups. wow these are fantastic! 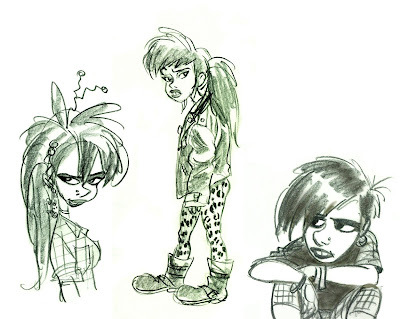 there's something great about roughs, especially for a kind of gritty punky character like this it totally works! these are neat. love the fez guy too. your cleanup (previous) is nice and doesn't lose the feel of these. i always feel like the longer i work on a drawing the worse it gets. These are brilliant. Your roughs are fantastic. I wish there was a way to keep the feel of them in the final product. By the way Mr. Camp, can you look at my latest post at my blog. I think you might like it. please help me . i am trying to draw but not able to draw correclty . i want to know how should i begin . which part should i concentrate on . i am newbie to drawing . Nick just start drawing. anything. there's no secret. the more you draw the better you become. are you looking to go into cartooning? if so check out Preston Blair's animation book. but in any case just keep practicing. that's what it's all about. i will start practicing more on drawing . i really love drawing :). yes i heart abt Preston Blair's animation book . ok will get the same and start working on it . Any advises . thanking in advance . i really love bob drawing . hope so one day i will be able to draw like him :) . best and warm wishes to everyone for the new year !!! Yeah, something about trying to make something look good when it's already good just messes it up. Thanks. I checked your blog. Yeah I think he termite terrace guys could've done a feature but I've worked on both and it's also about the story and short form comedy is a very different animal from feature length animation. Yeah Mike is right. Just draw as much as you can. carry a sketch book everywhere and draw draw draw! Study caricature! Can you find all the FBM attorneys?